I’ve been planning this for a year or so, and now I can finally get it out there. I’m starting a new blog called Held Over! As you can see from the banner above, it will showcase old movie advertisements. Many of the ads will be from newspapers (hence the Held Over! catchphrase), but I’ll also include other print media like magazines and comic books. 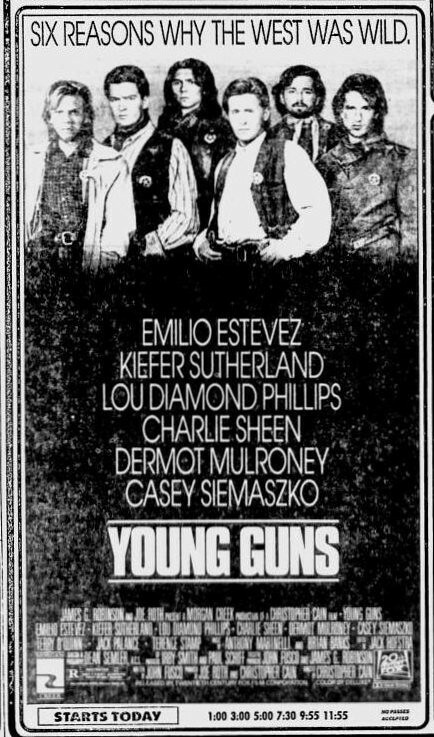 I’ve been stockpiling movie adverts since the mid 80s, and I finally am getting my s**t together and starting to share them online. Don’t worry, I’ll continue posting movie anniversary articles on this blog. The new blog will mainly showcase the scanned movie ads as well as a little commentary (historical context, relevance, interesting trivia, etc) from me. I’ll even aggregate some of the scans on the new blog into articles on this blog. When I do that, you’ll see the above banner and the article will be tagged with Held Over. So, where did this come from? Well, when I was growing up I loved going to the movies. I loved them so much, that I would cut out advertisements for my favorite movies from newspapers and magazines. 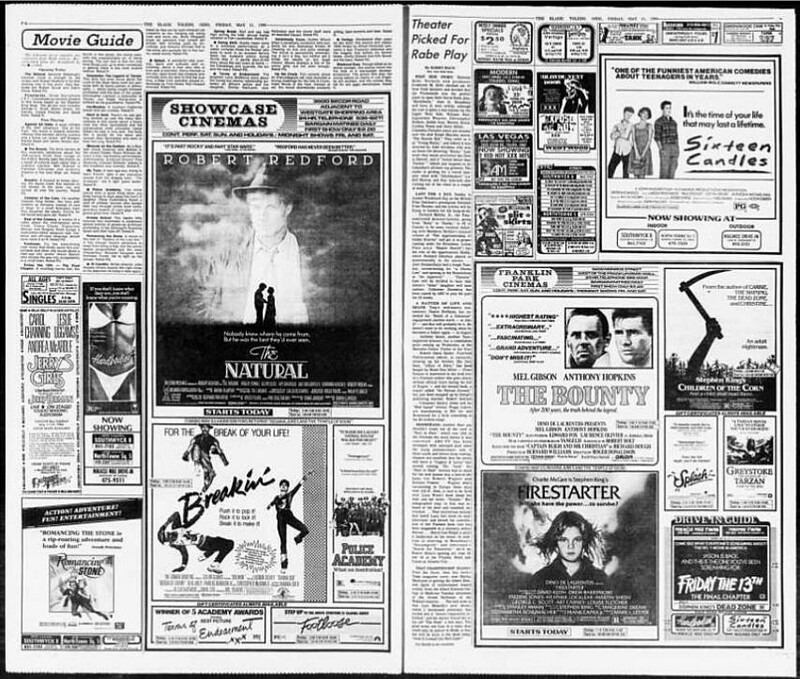 I also spent a good amount of my time in college at the Auburn University library combing through old newspapers on micro phish looking at movie advertisement sections. Well, I was also looking up old 80s NBA box scores featuring Larry Bird and John Stockton, not just movie adverts. Wow, could that confession have sounded any dorkier? No, probably not. 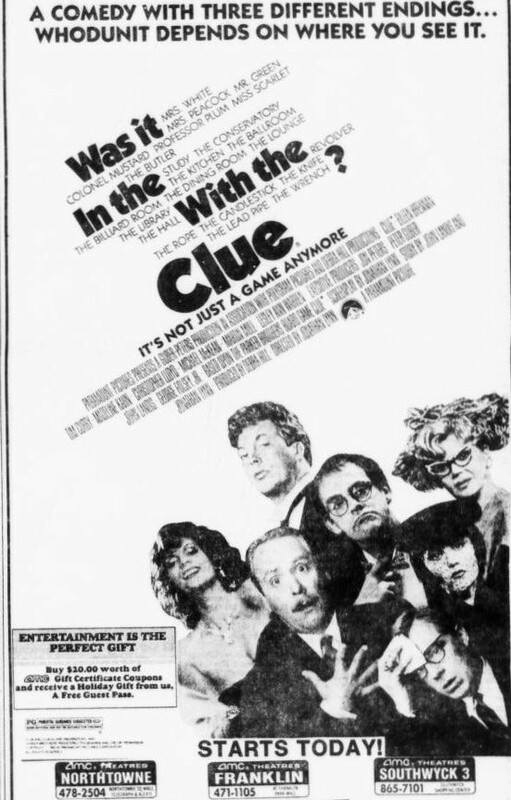 Anyway, throughout the 80s and early 90s, newspapers contained a wealth of awesome movie ads in their movie sections. Movie sections could take up two or three full pages advertising what movies are currently playing. For instance, here’s a movie section from the day I was born, May 9, 1974. Click it to see it bigger on Flickr. Nearly two full pages are taken up with movies of the day. And there are some good ones like The Sting, Blazing Saddles and The Exorcist. There are also some stinkers like Zardoz and Great Gatsby. Hmm, actually, I just this moment noticed there are three movies playing starring Robert Redford; The Candidate, The Sting and The Great Gatsby. You don’t see that too often these days. 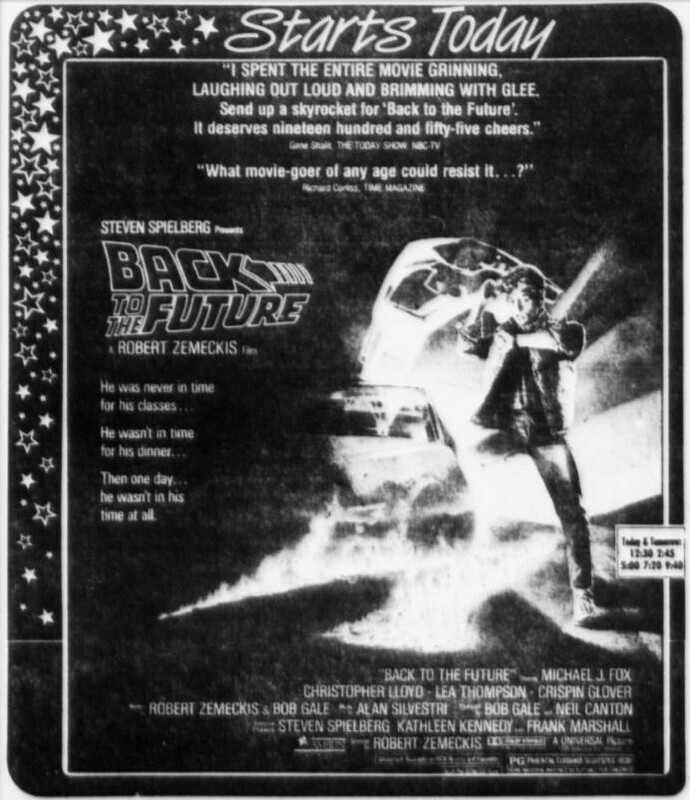 Here’s a movie section from 2 days after my 10th birthday; May 11, 1984 (Click for bigger on Flickr). Another good two pages taken up with the movie section. And we see a bunch of really good movies like The Natural, Sixteen Candles, Breakin’, Firestarter, Romancing the Stone and Friday the 13th IV. And yes, for my 10th birthday I actually picked to go see Breakin’ over all those other movies. Don’t judge. Unfortunately today, the movie section has dwindled down to one corner of one page (if there’s one at all). Being able to look up movie times on the internet has caused the once proud movie section to become a wasteland of barely there advertising. 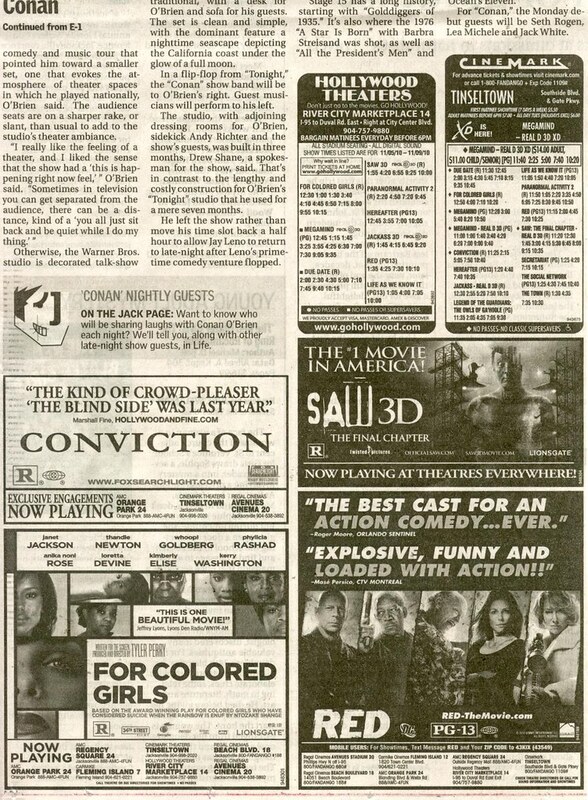 For comparison, let’s look at the movie section for my local Florida Times-Union from November 2010. The lower half of one page. That’s it. I only see ads for four movies. That. Is. SAD. I am mourning the loss of one of our great pop culture institutions, the newspaper movie section. So, this is the hole in our hearts that I hope Held Over! will fill. Bringing you all the awesome ads from the movies you loved as a kid. Nothing more, nothing less. I’ve already begun using some of the advertisements on this blog that you’ll see over there. For instance, I’ve already posted Clue The Movie, Young Guns and Back to the Future right here on this blog for their respective movie anniversaries. That’s what you’ll see every Monday, Wednesday and Friday on Held Over! So stop by and take a look. This entry was posted on December 20, 2010 at 8:00 am and is filed under 80s, advertising, movies, pop culture with tags advertising, Held Over, movies, pop culture. You can follow any responses to this entry through the RSS 2.0 feed. You can skip to the end and leave a response. Pinging is currently not allowed. What a cool and fascinating concept, Pax. I can’t even remember the last time I looked in the paper for a movie listing–things certainly have evolved. 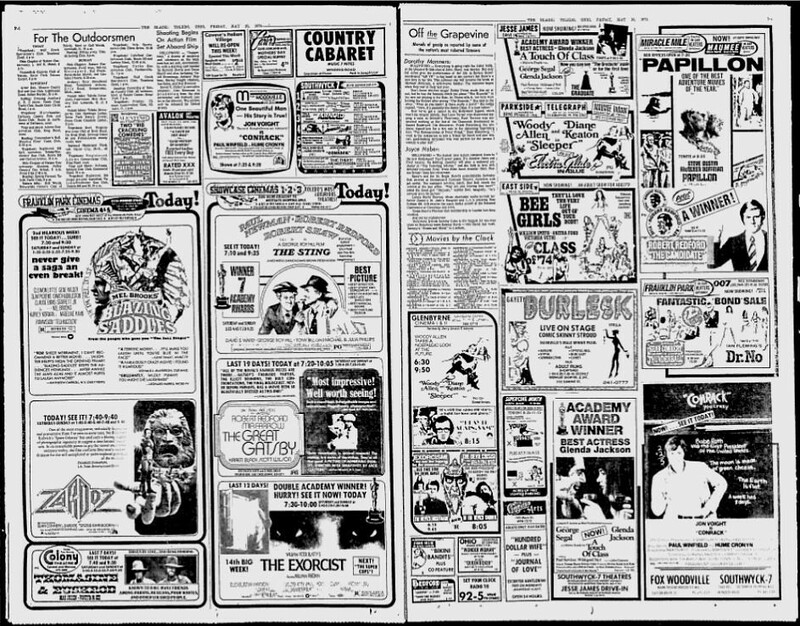 I can remember looking forward to the Rocky Mountain News Weekend section and seeing pages of ads for several movies (as well as reviews from local critic Robert Denerstein). Now, you dont even have times from certain chains (AMC) in the newspaper. What a sad lost. It’s nice that you used the Toledo Bade in these examples, though I always felt I saw it a lot better out of the Detroit papers myself. I remember all those theaters well. Toledo doesn’t even have half as many as it once had 30 years ago (since I see they merely consolidate them all into one or two pocketed areas of a dozen rooms each). Arguably you can say the rise in digital technology has put the newspaper industry into a spiral downslide as it is. The concept of a movie poster alone is in trouble as I see it if we let creativity continue to erode away such a lost craft.